This research report answers the question, how and specifically in what passages do the distinct Rabbinic modes of discourse, Halakhah and Aggadah, intersect? How do they make a statement in common? Halakhah is given priority. Then where and how does Aggadah play a role in Halakhic discourse? What is at stake is the context of thought and expression established by systematic composites, compilations of many discrete facts in the service of a coherent argument. What is catalogued is the intersection of large aggregates of well-composed Aggadic data in a Halakhic composite or of Halakhic ones in an Aggadic setting. The upshot is simple. The Aggadic documents rarely introduce Halakhic materials in their exposition of Aggadic propositions, and the contrary is also the case. The exposition of the Halakhic components of the Halakhic documents, meaning, nearly the entirety of the Mishnah, Tosefta, and Yerushalmi, and the greater part of the Bavli, only rarely requires Aggadic complements or supplements. 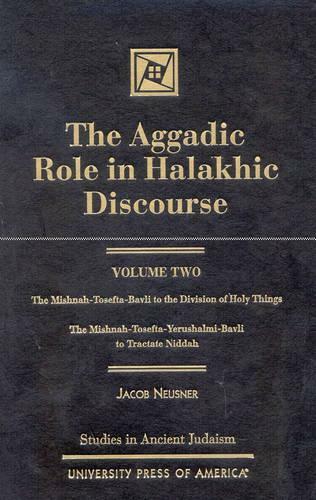 Yet while the Aggadic documents rarely resort to Halakhic materials to make the case they wish to set forth, in some of the Rabbinic documents of the formative age the presentation of the Halakhah is accompanied by a massive Aggadic component. Why, and with what outcome? The answers to all of these questions are spelled out in this three-volume account of the data.